Fill in the order form with informations on your yacht colours/waterline styles/boat name/sail number plus name of sailmaker/builder or/and a photo. I will make an A3 size (420 x 279) drawing for you, which will be sent by Email in PDF format as a proof. 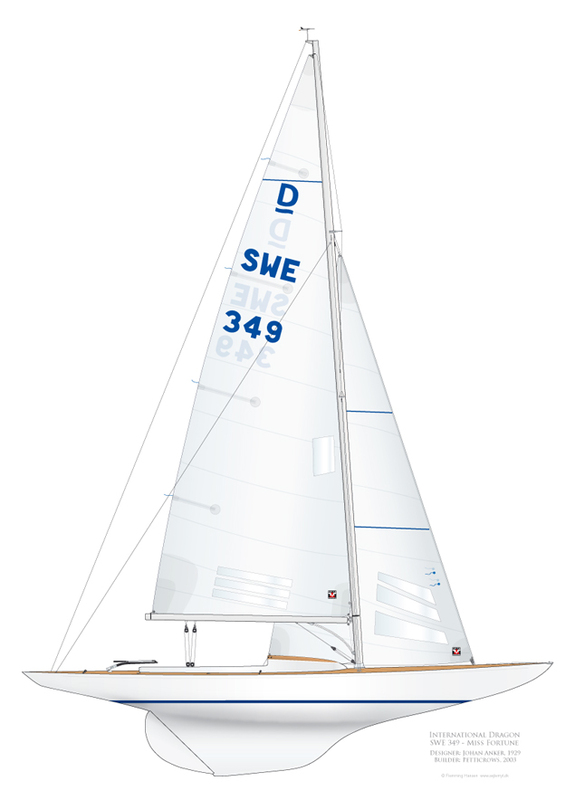 A drawing costs for Class boats for example Dragon, Euro 80, whether it is a glassfibre, wooden boat or painted. You will initially receive a PDF file as a proof, so you can communicate on Email about any corrections to the boat. You will then receive a new proof. Along with the new PDF-drawing proof you will receive an invoice, payable over banking. Remember to enter invoice No. Once payment is completed you will receive a Email with your yacht in the approved PDF-drawing file, that you can use as you wish. The graphic artist and sailor Flemming Hansen from Denmark draws the very beautiful and meticulous yachts on his Mac-computer.